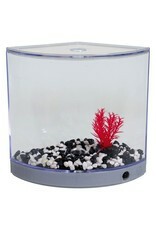 Aquaria BettaArc LED Betta Kit - Silver - 1.2 L - Rick's Pet Stores Inc.
BettaArc LED Betta Kit - Silver - 1.2 L The Aqua One BettaArc is a 1.2 L acrylic aquarium featuring a modern, curved design. 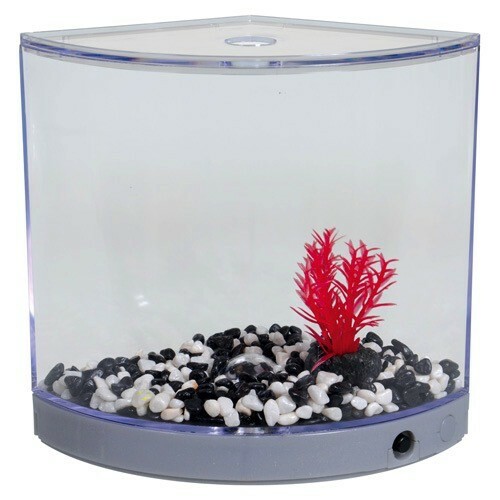 Perfect for desktops, countertops and other small spaces, this kit makes a wonderful home for your favorite Betta and includes just about everything you need to get started - just add water and fish! To light up your Betta's new home, the BettaArc comes equipped with a color-changing LED base light. This shimmering LED automatically cycles through the colors of the rainbow to help accentuate the beauty of your Betta and its environment. It is easily operated with a front-facing on/off switch, and works with 3 x AAA batteries (sold separately). The Aqua One BettaArc is designed for easy setup and maintenance. Great for beginners and experienced aquarists, this complete kit includes a safety lid with feeding hole, Betta water conditioner, Betta food sample, decorative gravel, and plastic plant ornament. Use the included decor, or add your own for a more personal touch! 7" x 4" x 6.5"